Very easy to grow 3 seeds (all fem) gave me two separate phenos. I grew them in my veg tent with no problems. One tall one short phenom. The tall one had incredible yeild for an auto at 1.7 g per watt. The shorter one was lower yeild at 1.4 g per watt. Overall I was very impressed at the volumn and quality of these great genetics. Well done! One of the only autos I grow! Great stuff!! Bought a pack of five seeds, germinated all and nothing happened. Been growing for years so definitely not s rookie. Very disappointed with the seed. There is a few absolutely amazing phenotypes among the ones I got. Wish I could have saved them all! Great taste and satisfying high. Will run again, easy to handle and delivers exactly what it promised. Best seed bank I ve have seen in my hole life, the quality is just "the best" continue with this excellent service !!! I grew two of plans of this strain, your picture on the website of the finished bud is 100% accurate. Grows very nice if you know what you're doing. Smokes amazing, the exhaled smoke coming out of your lungs has a very nice aroma too it also. If I grind a bit up and leave it in the open lid, I can't resist its sweet smell, and it's not too long till I'm smoking. I will be buying these seeds again. also, I used all the trim to make some dry ice extracted bubble hash, OMG was that nice :) If you are thinking of growing an autoflower of blue dream, it's a great plant to grow! You will love watching how fast these grow. I bought 5 of these seeds and I had planned to grow them all indoors in a tent under 600w hds, but I got fed up with waiting to get all my growing gear together, so I popped a couple 6 weeks ago, planted them in 22l root pouches outdoors in my back garden ( I'm in the southern UK.) They're the picture of health, with loads of branches and 2ft tall already! This is my 1st ever griw, so I'm stunned at the plants (and my) success so far! I'll update when they're harvested, thanks HSO, I'll be back with my wallet soon. Very uniform growth. Great taste, great yields, great flavor ! Definetly one of the highest yielding , strongest autos I've grown. Trichomes glisten and fingers stick together. Super happy with this strain! It was a "dream" to grow. Great taste and even better high. It had a great yield for an autoflower, better then other brands I've grown. Also was a really quick grow. Every seed popped and sprouted into a wonderful plant. Super easy grow with no problems. I would highly recommend this for anyone wanting to try growing autoflowers. I'll be buying it again. You can't go wrong with Humboldt seeds! Humboldt Blue Dream Auto review Living in a cold northern climate with only a short summer the autoflower cannabis variations came as a godsend! Triggered into flowering by age (instead of being light-cycle dependent as regular strains are), it allows me to finish an outside grown crop under optimal lightning (as nature permits of course) which with a "regular" photoperiod strain just wasn't really feasible over here. Regular outdoor crops normally are finishing late september / october here at which point the sun is to weak (if at all shining), temperatures are far to low and humidity to high causing problems with mold and toprot and at best unripe buds. 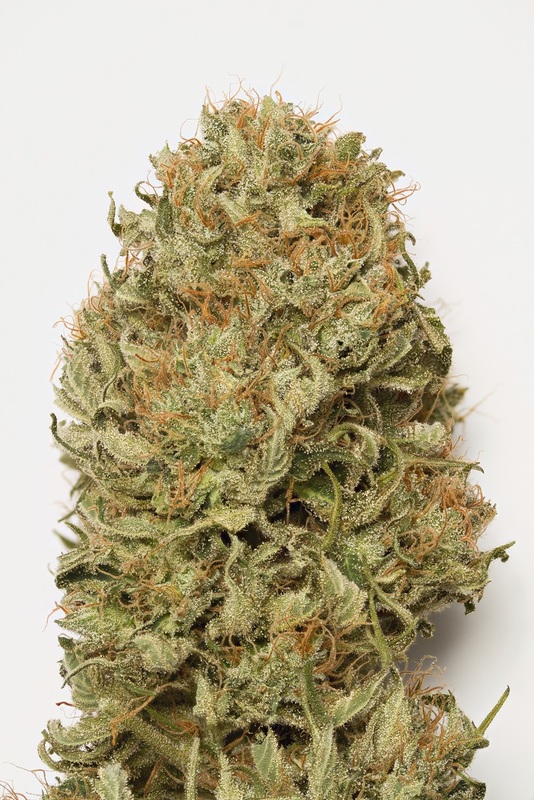 Following-up on the buzz the autoflower movement is creating on the net, and it's reviews getting more and more promising, I decided to give it a go at growing some myself. Did order myself a 5 pack of Humboldt's Blue Dream auto. Germination - June 15 Pre-soaked the seeds in plain tap water for about 24 hours at which time the beans had cracked and were already sprouting. Transfered them to a moist towell for another day which grew their sprouts. Popped the seeds in cocos with an added dose of wormcastings, straight in a 3 gallon containers. Plants were grown in a wall greenhouse with direct sunlight for about 8 to 9 hours daily (if shining of course). Seedling The young seedlings popped up through the soil within 2 days. Beside a generous dose of a wormcasting substrate added to it's growing medium (cocos), plants were given plain water in moderate doses, not to overwater the plants. As we had a quite moderate start of the summer this year (and already living in a northern climate) growth was quite slow but eventually growing into a 20 / 25 cm plant in about 25 days (5th node) at which time first flowers started to appear. Vegetation (rapid growth stage) / Flowering Differing from "regular" photoperiod strains, which pass through a growth fase before starting flowering (dependent on the light to approach it's 12 / 12 cycle), "autoflowering" plants do their flowering while growing at the same time (disregarding the light cycle but triggered by age). First flowers started appearing at around a 25 cm height (9.8 inch) / 25 day cycle at around which time I started feeding them nutrients - EC 1.4 / PH 5.8 - kept at this level for the next 2 -3 weeks. Over the next weeks a vigorous growth would occur with the plant stetching to a 150 cm / 59 inch height with it's side-branches & buds developing simultaniously. After giving her a "flush" (Ph 5,6 - no nutrients added to the water) to clean out the possible upbild of nutrients in the medium, I slightly did increase the EC to about 1.5 / 1.6 level, incorporating a healthy dose of unsulfered molasses, for the following two weeks as the plants seemed to cope well with a stronger feeding. Praying leaves, showing no burn at all even at this higher regime (makes me wonder if I should have started raising strenght earlier and maybe even topped feeding at a 1.8 EC level?). In growth / flowering "Blue Dream" really shows it's sativa / haze heritage, growing slender & stretchy plants with quite large internodes, good branching but with little folliage. Bud development was steady throughout it's growth stage, but only started to flesh-out around August 15 when most of the plant's stretch was completed, producing pinecone shaped flowers, nicely clustering together into buds over time. A nice coating of cristals started to appear and the greenhouse started smelling of fresh roasted coffee with a warm, earthy spiced backing. Stopped adding nutrients a full two weeks before harvest, giving them only plain PH'ed water (now at around Ph 6.0) until finish to properly flush out the remaining nutrients. Harvest: September 9 - 15 We were lucky to enjoy a few weeks of particularry nice weather (indian summer) towards the end of their flowering period (late august, early september) which surely helped the finishing / riping of the buds. Clipped the top buds first, the lower branches a few days later offering them full exposition to properly finish. Clipped the (few) fan leafs before hanging their branches upsided down for about 10 days in a dark, well vented room after which they were given a trim of the sugar leafs and were moved to glass jars to finish their curing. Dry weight buds / plant (fully trimmed, before curing): Not withholding we had a quite cool and sun-lacking start of the growseason (which certainly will have had an inpact on the plant's structure and developement) the streak of fine weather in the final weeks of flowering pulled us through and we managed to harvest an average of 45 grams (1.7 ounces), after initial drying, of resin covered buds. End October smoke review: With the buds now having had 6 weeks of curing time in the glass jars it is time to finally sample the goods... Grown under the natural sunlight the buds weren't as tight (particullary on the more "hazy" pheno) and a bit more leafy as would be under HPS lamps. Nevertheless they were abundantly covered in resin, reeking as abundantly of freshly ground coffee with a earthy sweet spicey backing. Fragnant, aromatic, but not too overpowering on the palatte, quite elegant & lean with a more fruity touch then the nose predicted. Quite mild & lingering, but very present clear cerebral high, very nice for daytime use. Overall opinion: It was a joy to grow the "Blue Dream Auto" in the greenhouse. As pointed out she requires a quite heavy feeding scedule to properly develop. Super easy to grow, developing into a fully ripened, bud laden tree in just under 3 months, even under less then optimal condiditions! Will go for a slightly bigger container for next year's grow though. HSO autos have always ran great for me, usually giving me about an Oz or so per. Great to throw in the veg area for extra personal. Plants grow nice outdoor in big pots...65 to 70 wont happen... Give them 3 months to finish. We got this as a freebie. Such a fruity citrusy smell and taste. The high was superb! Perfect day time high for doing activities. Perfect social high. Off this auto flower we got about an oz and half using platinum LED grow lights. This is my first time using HSO seeds and I must say I'm very satisfied. The shipping was fast and secure and the packaging looks very nice and is aesthetically definitely the best out of all the companies. Seeds germinated well and fast and when planted started growing very nicely and fast as well. Grew pretty tall with lots of buds and side branches, the smell is great and I'm just waiting to cure it a bit more before I try the end product! Definitely a strain to recommend - I even got a bit of bu mold at one point, but Blue Dream Auto seems so resistant that it didn't even spread.